The Southwestern Front was a front of the Red Army during the Second World War, formed thrice. 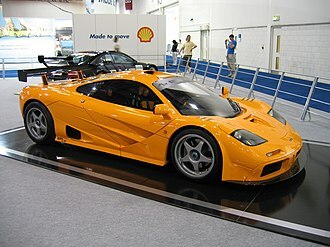 It was first created on June 22, 1941 from the Kiev Special Military District. The western boundary of the front in June 1941 was 865 km long, from the Pripyat River and the town of Wlodawa to the Prut River and the town of Lipkany at the border with Romania. It connected to the north with the Western Front, which extended to the Lithuanian border, and to the south with the Southern Front, which extended to the city of Odessa on the Black Sea. The Southwestern Front was on the main axis of attack by the German Army Group South during Operation Barbarossa. 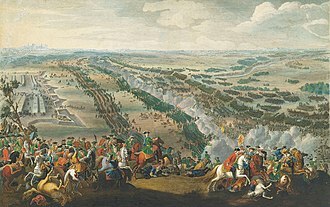 At the outbreak of war with Germany, the Front contained the Soviet 5th, 6th, 26th, and 12th Armies along the frontier. 16th and 19th Armies were in reserve behind the forward forces. 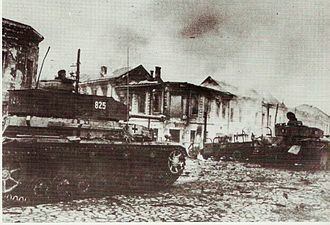 These forces took part in the tank battles in western Ukraine and were surrounded and destroyed at the Battle of Uman and the Battle of Kiev (1941) in August and September 1941. 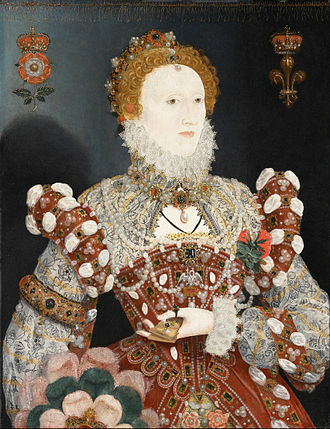 The Front was immediately re-established with new forces. During the period of the Battle of Moscow it was under the command of Marshal Timoshenko, and included from north to south the 40th, 21st, 38th and 6th Armies. It was formally disbanded on July 12, 1942 and the forces transferred to the Stalingrad Front and Southern Front. 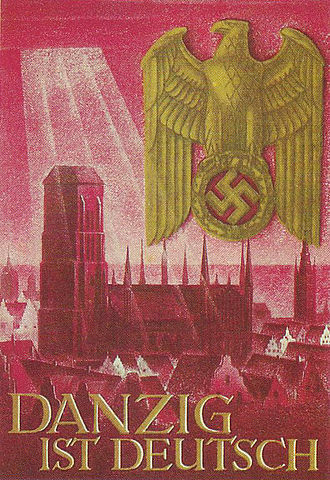 The Front was reformed from reserve armies on October 22, 1942. It was renamed the 3rd Ukrainian Front on October 20, 1943. 3rd Ukrainian Front's first operations were the Battle of the Dnieper and the Battle of Kiev (1943). Rodion Yakovlevich Malinovsky was a Soviet military commander in World War II, Marshal of the Soviet Union, and Defense Minister of the Soviet Union in the late 1950s and 1960s. He contributed to the defeat of Germany at the Battle of Stalingrad. During the post-war era, he made a contribution to the strengthening of the Soviet Union as a military superpower. 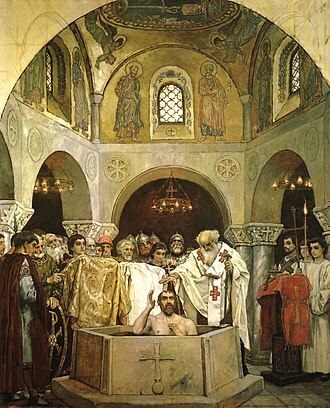 Born in Odessa, some believe that Malinovskys father was of Karaite descent. After the death of his father, Malinovskys mother left the city for the areas of Ukraine. Her husband, a poverty-stricken Ukrainian peasant, refused to adopt her son, the homeless boy survived by working as a farmhand, and eventually received shelter from his aunts family in Odessa, where he worked as an errand boy in a general store. After the start of World War I in July 1914, who was only 15 years old at the time, hid on the train heading for the German front. He nevertheless convinced the officers to enlist him as a volunteer. In October 1915, as a reward for repelling a German attack, he received his first military award, the Cross of St.
George of the 4th class, soon afterwards, he was badly wounded and spent several months in the hospital. After his recovery, he was sent to France in 1916 as a member of the Western Front Russian Expeditionary Corps, Malinovsky fought in a hotly contested sector of the front near Fort Brion and was promoted to sergeant. He suffered a wound in his left arm, and received a decoration from the French government. Malinovsky fought against the Germans until the end of the war, during this time, he was awarded the French Croix de guerre and promoted to senior NCO. He returned to Odessa in 1919, where he joined the Red Army in the Civil War against the White Army and fought with distinction in Siberia. He remained in the army after the end of the conflict, studying in the school for the junior commanders. In 1926, he became a member of the Communist Party of the Soviet Union, in 1927, Malinovsky was sent to study at the elite Frunze Military Academy. He graduated in 1930, and during the seven years he rose to the Chief of Staff of the 3rd Cavalry Corps. Operation Barbarossa was the code name for Nazi Germanys invasion of the Soviet Union during World War II, which was launched on Sunday 22 June 1941. In the two leading up to the invasion, the two countries signed political and economic pacts for strategic purposes. 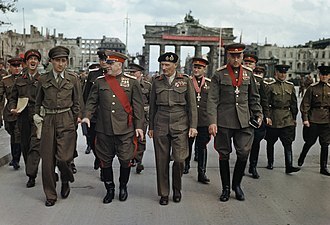 Nevertheless, the German High Command began planning an invasion of the Soviet Union in July 1940, over the course of the operation, about four million Axis personnel invaded the western Soviet Union along a 2, 900-kilometer front, the largest invasion force in the history of warfare. 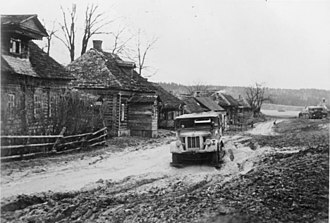 In addition to troops, the Wehrmacht employed some 600,000 motor vehicles, the offensive marked an escalation of the war, both geographically and in the formation of the Allied coalition. Despite their successes, the German offensive stalled in the Battle of Moscow and was pushed back by the Soviet winter counteroffensive. The Red Army repelled the Wehrmachts strongest blows and forced the unprepared Germans into a war of attrition, the Wehrmacht would never again mount a simultaneous offensive along the entire strategic Soviet–Axis front. 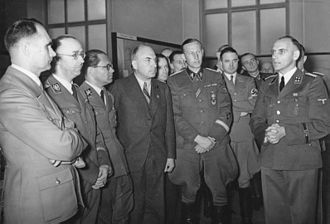 The failure of the operation drove Hitler to demand further operations of limited scope inside the Soviet Union, such as Case Blue. The failure of Operation Barbarossa proved a point in the fortunes of the Third Reich. Most importantly, the operation opened up the Eastern Front, in more forces were committed than in any other theater of war in world history. The German armies captured 5,000,000 Soviet prisoners of war who were not granted protections stipulated in the Geneva Conventions, a majority of them never returned alive. The Nazis deliberately starved 3.1 million of the prisoners to death as part of a Hunger Plan that aimed to reduce the population of Eastern Europe, over a million Soviet Jews were murdered by Einsatzgruppen death squads and gassing as part of the Holocaust. On 10 February 1939, Hitler told his commanders that the next war would be purely a war of Weltanschauungen. Totally a peoples war, a racial war, on 23 November, once World War II had already started, Hitler declared that racial war has broken out and this war shall determine who shall govern Europe, and with it, the world. The Workers and Peasants Red Army was the army and the air force of the Russian Soviet Federative Socialist Republic, and after 1922 the Union of Soviet Socialist Republics. 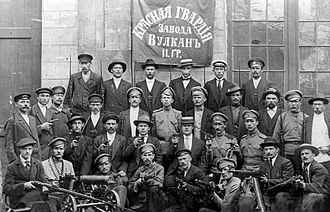 The army was established immediately after the 1917 October Revolution, the Bolsheviks raised an army to oppose the military confederations of their adversaries during the Russian Civil War. The Red Army is credited as being the land force in the Allied victory in the European theatre of World War II. During operations on the Eastern Front, it fought 75%–80% of the German land forces deployed in the war, inflicting the vast majority of all German losses and ultimately capturing the German capital. In September 1917, Vladimir Lenin wrote, There is only one way to prevent the restoration of the police, at the time, the Imperial Russian Army had started to collapse. The Tsarist general Nikolay Dukhonin estimated that there had been 2 million deserters,1.8 million dead,5 million wounded and 2 million prisoners and he estimated the remaining troops as numbering 10 million. Therefore, the Council of Peoples Commissars decided to form the Red Army on 28 January 1918 and they envisioned a body formed from the class-conscious and best elements of the working classes. All citizens of the Russian republic aged 18 or older were eligible, in the event of an entire unit wanting to join the Red Army, a collective guarantee and the affirmative vote of all its members would be necessary. 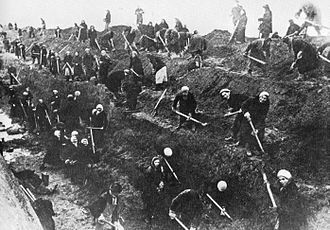 Because the Red Army was composed mainly of peasants, the families of those who served were guaranteed rations, some peasants who remained at home yearned to join the Army, along with some women, flooded the recruitment centres. If they were turned away they would collect scrap metal and prepare care-packages, in some cases the money they earned would go towards tanks for the Army. Nikolai Krylenko was the supreme commander-in-chief, with Aleksandr Myasnikyan as deputy, Nikolai Podvoisky became the commissar for war, Pavel Dybenko, commissar for the fleet. Proshyan, Steinberg were specified as peoples commissars as well as Vladimir Bonch-Bruyevich from the Bureau of Commissars, at a joint meeting of Bolsheviks and Left Socialist-Revolutionaries, held on 22 February 1918, Krylenko remarked, We have no army. The Army became the core for the Soviet occupational force in Afghanistan in 1980s, officially named as the limited contingent of Soviet forces in Afghanistan. By 25 August 1941 the 135th and 293rd Rifle Divisions, 2nd Airborne Corps, 10th Tank Division, and 5th Anti-Tank Brigade had been assembled to form the force. As part of the Southwestern Front, it took part in the Battle of Kiev, where the Army was badly shattered. By the time of the main German offensive against Moscow at the end of September, 40th Army began a slow and steady retreat to the east. By 3 November 40th Army had been driven from Kursk, the advance of 40th Army was less rapid. 40th Army retook Tim and advanced to within 30 kilometres of Kursk before being stopped by determined German resistance in mid-January, thereafter the frontline stabilised west of Tim through the rest of the winter and through the spring. On 3 April 40th Army and its sector of the frontline was assigned to the command of Bryansk Front, on 12 May 1942 Southwestern Front launched a major offensive to retake Kharkov by an encirclement from north and south. At the same time Bryansk Front was preparing an offensive of its own to retake Orel, this hurriedly prepared offensive by 40th Army in the second half of May made little progress. In June 1942, Operation Blau saw Hoths Fourth Panzer Army thrust in full force against 40th Army, the 40th Army fell back from the Kastornoye area back to Voronezh, alongside the 4th, 17th, and 24th Tank Corps. In response, the STAVKA hastened to establish the new Voronezh Front, during July, 40th Army, subordinated to Voronezh Front, was assigned to defend the river Don along the Liski - Pavlovsk sector, positions that it held throughout the remainder of 1942. On 12 January 1943 40th Army began offensive operations against the flank of the Hungarian Second Army north of Liski. This offensive was coordinated with an attack by a Soviet tank army further south to surround Axis forces on the Liski - Novaya Kalitva sector of the Don front, by 18 January most of the Hungarian army and an Italian corps had been surrounded east of Alekseyevka. Nikolai Fyodorovich Vatutin was a Soviet military commander during World War II. He was ambushed and mortally wounded in February 1944 by the Ukrainian Insurgent Army, Vatutin was born in Chepuhino village in Voronezh Governorate, into a peasant family of Russian ethnicity. Commissioned in 1920 to the Red Army, he fought against the Ukrainian peasant partisans of Nestor Makhno, the following year, he became a member of the Communist party, and served diligently in junior command positions. Starting in 1926, he spent the decade alternating service with studies in the elite Frunze Military Academy. 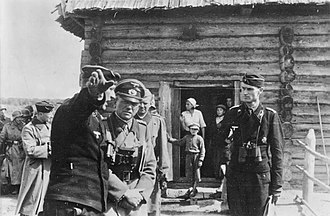 The 1937–1938 purge of Red Army commanders opened the road to promotion – in 1938, he received the rank of Komdiv, throughout this period, Vatutin combined military service with intensive Party activities. In 1939, Vatutin planned operations for the Soviet invasion of Poland with Germany, in 1940, under the command of Georgy Zhukov, this group seized Bessarabia from Romania. Vatutin was, not up to his new appointment, while innovative and hard-working, he lacked any experience and his knowledge of operational art. Still, his peasant roots, relative youthful age, and party zeal made him one of Stalins few favorites in the Soviet military, together with the rest of the Red Army high command, failed to prepare the army for the German attack of 22 June 1941. On 30 June 1941, he was appointed Chief of Staff of the North-Western Front, in this role Vatutin did not try to claim success for himself in battles, but made a point of identifying and promoting talented subordinates. 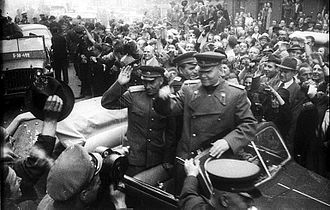 He was notable for his audacity, at that stage of the war, most of the Soviet generals, shattered by defeats, were reluctant to carry out offensive operations, but Vatutin thrived on attack. The Northwestern Front was defending Leningrad against approaches by the German Army Group North, Vatutin took command of the Soviet forces near Novgorod and rallied them for offense, attempting to encircle a large German force. He surprised Manstein, put him on the defensive, and forced the entire German Army Group North to regroup its troops to halt the Soviet offensive. Operation Koltso was the last part of the Battle of Stalingrad. 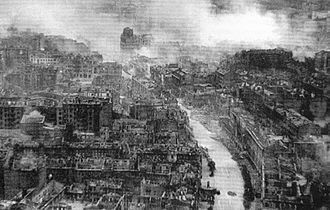 It resulted in the capitulation of the remaining Axis forces encircled in the city, the operation was launched on 10 January 1943 with a mass artillery bombardment of the German positions outside the city by the seven encircling Soviet armies. In the first three days, the Soviets lost 26,000 men and over half their tanks, the western half of the Stalingrad pocket had been lost by 17 January. On the 10th, it clear the main goal was the Pitomnik airfield. The 44th, 76th and 28th Infantry Divisions were badly hit, the 3rd Infantry Division, deployed on the southwestern corner of the cauldron since the end of Nov.1942, was ordered to retreat to new defensive positions to avoid encirclement. 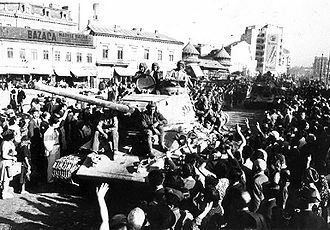 The fighting paused for four days while the Soviet forces regrouped and redeployed for the phase of the operation. The second phase of the offensive began on 20 January with a Soviet push toward the airfield at Gumrak, two days later, the airfield was occupied by the Soviets. Its capture meant an end to the evacuation of the German wounded, Paulus on 22 January sent a radio message to OKH, Russians in action in 6 km wide on both sides Voroponovo, some with flags unfurled to the east. Withdrawal to neighboring fronts who are without ammunition, supply with ammunition from other fronts no longer possible. More than 12,000 unprovided for wounded in the encirclement, what orders shall I give the troops who have no more ammunition and will be further attacked with heavy artillery and massed infantry. Fastest decision necessary because dissolution in some places already started, confidence in the leadership still exists. The Axis retreated back into the city itself, but resistance to the Soviet advance gradually diminished due to the exhaustion of all supplies on the Axis side. On 25 January, LI Corps commander Walther von Seydlitz-Kurzbach told his commanders to decide for themselves on the matter of surrender. He was immediately relieved of his command by Paulus, Seydlitz-Kurzbach fled the German lines under German fire and personally surrendered to the Soviets. The Battle of the Dnieper was a military campaign that took place in 1943 on the Eastern Front of World War II. It was one of the largest operations in World War II, Kiev was liberated in the Battle of Kiev. 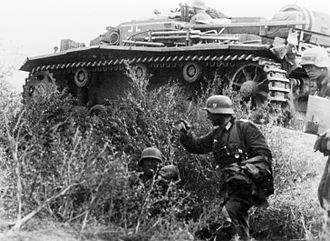 Following the Battle of Kursk, the Wehrmachts Heer and supporting Luftwaffe forces in the southern Soviet Union were on the defensive in the southern Ukraine, on the Soviet side, Joseph Stalin was determined to launch a major offensive in Ukraine. The main thrust of the offensive was in a direction, the northern flank being largely stabilized. The operation begun on 26 August 1943, divisions started to move on a 1, 400-kilometer front that stretched between Smolensk and the Sea of Azov. Overall, the operation would be executed by 36 Combined Arms, four Tank,2,650,000 personnel were brought into the ranks for this massive operation. The operation would use 51,000 guns,2,400 tanks and 2,850 planes, the Dnieper is the third largest river in Europe, second only to the Volga and the Danube. In its lower part, its width can reach three kilometres, and being dammed in several places made it even larger. Moreover, its western shore —the one still to be retaken— was much higher and steeper than the eastern, in addition, the opposite shore was transformed into a vast complex of defenses and fortifications held by the Wehrmacht. Faced with such a situation, the Soviet commanders had two options and this option were supported by Marshal Zhukov and Deputy Chief of Staff A. I. Antonov, who considered the substantial losses after the battle of Kursk. The second option would be to stage an assault without waiting. This option left no time for the German defenders. This second option was backed by I. V, Stalin due to the concern that the German scorched earth policy might devastate this region if the Red Army did not advance fast enough. STAVKA paid attention to the possible scorched earth activities of German forces with a view to preventing them by a rapid advance. The assault was staged on a 300-kilometer front almost simultaneously, all available means of transport were to be used to transport the attackers to the opposite shore, including small fishing boats and improvised rafts of barrels and trees. 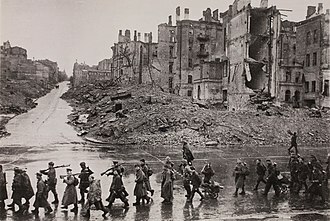 The Battle of Moscow is the name given by Soviet historians to two periods of strategically significant fighting on a 600 km sector of the Eastern Front during World War II. It took place between October 1941 and January 1942, the Soviet defensive effort frustrated Hitlers attack on Moscow, capital of the Union of Soviet Socialist Republics and the largest Soviet city. Moscow was one of the military and political objectives for Axis forces in their invasion of the Soviet Union. 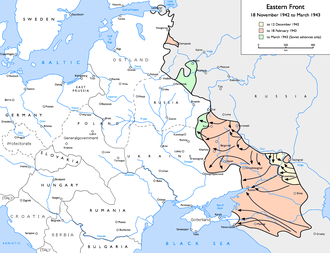 Operation Barbarossa, the German invasion plan, called for the capture of Moscow within four months, the German Army Group North moved towards Leningrad, Army Group South took control of Ukraine, and Army Group Center advanced towards Moscow. By July 1941, Army Group Center crossed the Dnieper River, in August 1941, German forces captured Smolensk, an important stronghold on the road to Moscow. At this stage, although Moscow was vulnerable, an offensive against the city would have exposed the German flanks. 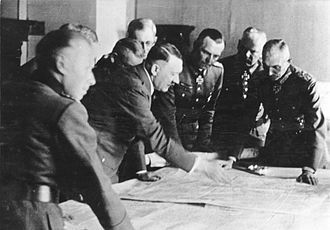 In part to address these risks, in part to attempt to secure Ukraines food and mineral resources, Hitler ordered the attack to turn north and south and eliminate Soviet forces at Leningrad and this delayed the German advance on Moscow. When that advance resumed on 2 October 1941, German forces had been weakened, for Hitler, the Soviet capital was secondary, and he believed the only way to bring the Soviet Union to its knees was to defeat it economically. He felt this could be accomplished by seizing the economic resources of Ukraine east of Kiev, when Walther von Brauchitsch, Commander-in-Chief of the Army, supported a direct thrust to Moscow, he was told that only ossified brains could think of such an idea. 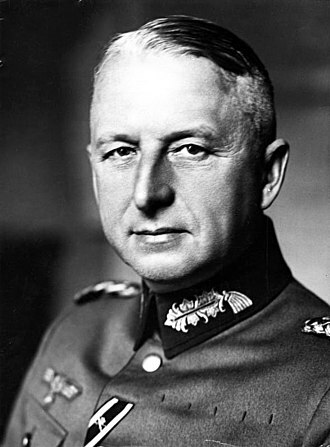 Franz Halder, head of the Army General Staff, was convinced that a drive to seize Moscow would be victorious after the German Army inflicted enough damage on the Soviet forces. This view was shared by most within the German high command, but Hitler overruled his generals in favor of pocketing the Soviet forces around Kiev in the south, followed by the seizure of Ukraine. 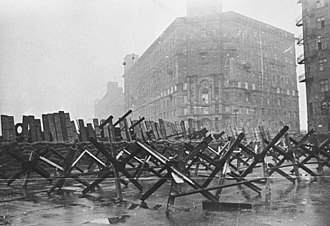 The move was successful, resulting in the loss of 660,000 Red Army personnel by 26 September, with the end of summer, Hitler redirected his attention to Moscow and assigned Army Group Center to this task. World War II, known as the Second World War, was a global war that lasted from 1939 to 1945, although related conflicts began earlier. It involved the vast majority of the worlds countries—including all of the great powers—eventually forming two opposing alliances, the Allies and the Axis. 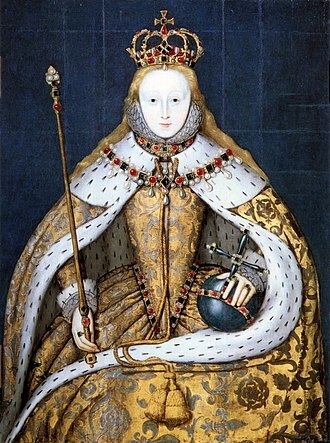 It was the most widespread war in history, and directly involved more than 100 million people from over 30 countries. Marked by mass deaths of civilians, including the Holocaust and the bombing of industrial and population centres. These made World War II the deadliest conflict in human history, from late 1939 to early 1941, in a series of campaigns and treaties, Germany conquered or controlled much of continental Europe, and formed the Axis alliance with Italy and Japan. Under the Molotov–Ribbentrop Pact of August 1939, Germany and the Soviet Union partitioned and annexed territories of their European neighbours, Finland and the Baltic states. In December 1941, Japan attacked the United States and European colonies in the Pacific Ocean, and quickly conquered much of the Western Pacific. The Axis advance halted in 1942 when Japan lost the critical Battle of Midway, near Hawaii, in 1944, the Western Allies invaded German-occupied France, while the Soviet Union regained all of its territorial losses and invaded Germany and its allies. During 1944 and 1945 the Japanese suffered major reverses in mainland Asia in South Central China and Burma, while the Allies crippled the Japanese Navy, thus ended the war in Asia, cementing the total victory of the Allies. 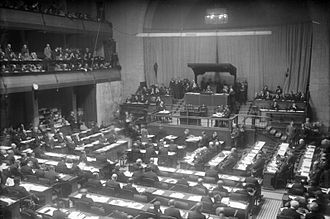 World War II altered the political alignment and social structure of the world, the United Nations was established to foster international co-operation and prevent future conflicts. The victorious great powers—the United States, the Soviet Union, the United Kingdom, the Soviet Union and the United States emerged as rival superpowers, setting the stage for the Cold War, which lasted for the next 46 years. Meanwhile, the influence of European great powers waned, while the decolonisation of Asia, most countries whose industries had been damaged moved towards economic recovery. 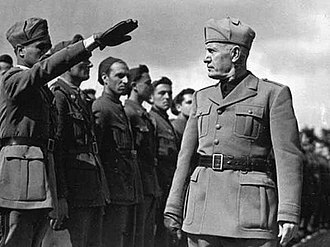 Political integration, especially in Europe, emerged as an effort to end pre-war enmities, the start of the war in Europe is generally held to be 1 September 1939, beginning with the German invasion of Poland and France declared war on Germany two days later. The dates for the beginning of war in the Pacific include the start of the Second Sino-Japanese War on 7 July 1937, or even the Japanese invasion of Manchuria on 19 September 1931. Others follow the British historian A. J. P. Taylor, who held that the Sino-Japanese War and war in Europe and its colonies occurred simultaneously and this article uses the conventional dating. Other starting dates sometimes used for World War II include the Italian invasion of Abyssinia on 3 October 1935. The British historian Antony Beevor views the beginning of World War II as the Battles of Khalkhin Gol fought between Japan and the forces of Mongolia and the Soviet Union from May to September 1939, the exact date of the wars end is not universally agreed upon. The Soviet Union, officially the Union of Soviet Socialist Republics was a socialist state in Eurasia that existed from 1922 to 1991. It was nominally a union of national republics, but its government. The Soviet Union had its roots in the October Revolution of 1917 and this established the Russian Socialist Federative Soviet Republic and started the Russian Civil War between the revolutionary Reds and the counter-revolutionary Whites. 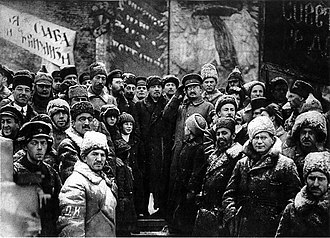 In 1922, the communists were victorious, forming the Soviet Union with the unification of the Russian, Ukrainian, following Lenins death in 1924, a collective leadership and a brief power struggle, Joseph Stalin came to power in the mid-1920s. Stalin suppressed all opposition to his rule, committed the state ideology to Marxism–Leninism. As a result, the country underwent a period of rapid industrialization and collectivization which laid the foundation for its victory in World War II and postwar dominance of Eastern Europe. Shortly before World War II, Stalin signed the Molotov–Ribbentrop Pact agreeing to non-aggression with Nazi Germany, in June 1941, the Germans invaded the Soviet Union, opening the largest and bloodiest theater of war in history. Soviet war casualties accounted for the highest proportion of the conflict in the effort of acquiring the upper hand over Axis forces at battles such as Stalingrad. Soviet forces eventually captured Berlin in 1945, the territory overtaken by the Red Army became satellite states of the Eastern Bloc. The Cold War emerged by 1947 as the Soviet bloc confronted the Western states that united in the North Atlantic Treaty Organization in 1949. Following Stalins death in 1953, a period of political and economic liberalization, known as de-Stalinization and Khrushchevs Thaw, the country developed rapidly, as millions of peasants were moved into industrialized cities. The USSR took a lead in the Space Race with Sputnik 1, the first ever satellite, and Vostok 1. In the 1970s, there was a brief détente of relations with the United States, the war drained economic resources and was matched by an escalation of American military aid to Mujahideen fighters. In the mid-1980s, the last Soviet leader, Mikhail Gorbachev, sought to reform and liberalize the economy through his policies of glasnost. Clockwise from top left: German soldiers advance through Northern Russia; German flamethrower team in the Soviet Union; Soviet Ilyushin Il-2s flying over German positions near Moscow; Soviet prisoners of war on the way to German prison camps; Soviet soldiers fire artillery at German positions. 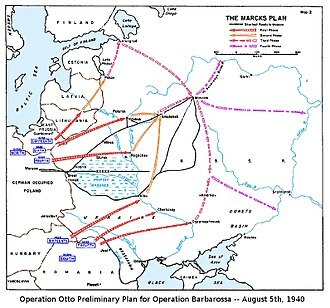 The Marcks Plan was the original German plan of attack for Operation Barbarossa, as depicted in a US Government study (March 1955). A German Tiger tank and knocked-out Soviet T-34 tank during the fighting in the southern Soviet Union. 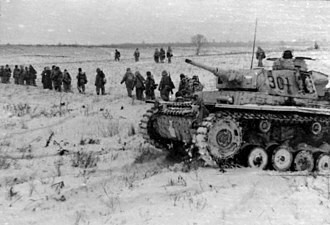 A battalion of Tiger I tanks was deployed to Army Group Don in an effort to strengthen the German drive to Stalingrad. The Battle of Stalingrad is considered by many historians as a decisive turning point of World War II. Russian and Cossack troops take the fortress of Khadjibey, defeating the Ottomans and thus providing the impetus to found Odessa. German pontoon bridge over the Dnieper near Kiev in September 1941, set up in less than 24 hours. 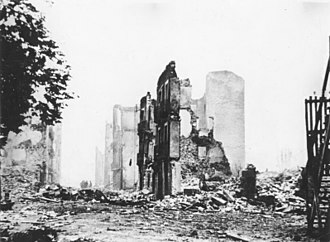 The ruins of Stalingrad on 2 October 1942. Soviet women with their belongings amidst the firebombed ruins of Stalingrad on 24 August. An industrial plant in Stalingrad on 16 November 1942, destroyed by Stukas. Disposition of forces in and around Stalingrad. Monument to Mikhail Panikakha in Volgograd. A mixed aircraft and ship formation of military vehicles during an exercise with USN and JASDF vehicles.